Yesterday we held a Town hall meeting at Brooklyn Borough Hall about the state and city plan to share personally identifiable student information with a corporation called inBloom inc. and other third party vendors. Some of the disturbing revelations from Adina: The city and state have already shared confidential student data with inBloom. They don't know how much they will have to pay for inBloom's "services" starting in 2015. If there is a data breach from inBloom (as many people believe is nearly inevitable) the state will be legally and financially liable, since the Gates Foundation has insulated itself and inBloom from responsibility. If this highly sensitive information leaks out, it could lead to class action suits against the state for many millions of dollars. Just yesterday, it was reported that LivingSocial suffered a massive breach from a data cloud. Living Social is partially owned by Amazon, which will host the inBloom data cloud. Why is NY State -- the only inBloom participant currently committed to sharing student data from throughout the state -- insisting on gambling with millions of children's privacy and security along with all these financial risks? I am left wondering, even more than before. Below are Part I and Part II of the event. Part I starts with some parent outbursts, followed by introductory remarks from Margaret Kelley of the Brooklyn Borough President's office and Stephen Boese of the Learning Disabilities Association, and Adina's presentation and mine. Part II includes the comments and questions from the audience. I have also sent follow-up questions to Adina and I will post her answers when I receive them. Thank you to all the co-sponsoring organizations and individuals, those you who came and Brooklyn BP Markowitz for hosting. Now please contact your legislators and urge them to support the Student Privacy bill! Student Privacy & inBloom Town Hall meeting: part 1 from Class Size Matters on Vimeo. Student Privacy & inBloom Town Hall meeting: part 2 from Class Size Matters on Vimeo. Van White, the attorney handling the class action lawsuit of parents whose child was punished for opting out of the state exams in the Rochester area, is looking for information from New York state parents, to be sent to him at van.white@thelegalbrief.com. More specifically, he would like to hear from parents if their children opted out of these exams and were punished in some way by their schools or districts, as well as from parents whose children opted out but received no punishment. He is especially interested in hearing from parents of children who were deprived of some "instructionally related event or material" as a result. Please send him your stories, along with your name, school, district and your child's grade level, to help him gather evidence about unequal treatment of students across the state. His email is below; please contact him directly with this information. More on this case can be found here. The defendants in the lawsuit include the State of New York, the NYS Education Department, Commissioner of Education John B. King, the Rush-Henrietta School District, its Board of Education, Superintendent J. Kenneth Graham Jr., and the Burger Middle School principal. And please forward this message to other parents. Thanks! Hello. My name is Van White. I am an attorney in Rochester, NY. By now I think you may have heard from several sources …that I am representing a family whose son is being punished (no extra curricular activities for each day he refused to take the state assessment exams). One of the claims made in the suit is that there is great disparity among how children are being treated for having opted out and this inequity, we argue, amounts to a violation of the Equal Protection clause. To support this claim I'm looking for parents/students who opted out and were either punished or not punished. Because it seems that most districts did not punish, I am especially interested in cases where students were punished. Moreover in those cases (where they were punished) I am particularly interested in those students who were denied access to some instructionally related event or material. (That is because the more the activity relates to the instructional arena, the more likely the court will find that it is a constitutional violation.) I am trying to amend the complaint (with any additional clients or facts that I get) to keep the case moving along, so your prompt response would be appreciated. Please let me know if you need anything further. Thank you. One of my particular gripes is how the politics of education in NYC is usually framed by the media in simplistic terms as a battle between the teachers union vs. the mayor, without any reference to the views of parents, advocates or other members of the community. This is especially true now that we are in the midst of a mayoral race. If one or more of the candidates take a different position from the mayor on education, this is usually interpreted as a naked attempt to appeal to the union, with little acknowledgement of the fact that the political crosscurrents are far more complex, and that they may also be responding to the priorities and views of public school parents, community members, or voters in general. There were also moments when it felt like United Federation of Teachers President Michael Mulgrew should have had a seat onstage with the other candidates. The four Democrats all praised the union’s push for smaller class sizes and more education funding. Yet class size is also the top priority of NYC parents, according to the DOE own surveys, and is even more a potent political issue with them, especially given the mayor’s statements favoring class size increases and the fact that class sizes are now the largest in 14 years. And most New Yorkers support more funding for the public schools, especially after five years of cutbacks. The fact remains that many candidates may take aggressive positions on class size, education funding, co-locations, school closings or other hot-button education issues for reasons other than simply to woo the UFT, especially given that only 22 percent of the public trust the mayor’s current policies on education. I asked Ben Chapman of the Daily News, a very accessible reporter whom I respect, the following question a few weeks back: Why are the education issues defined by the media in general as driven almost entirely by the UFT? Below is Ben’s response; please add your thoughts in the comment section. Does this practice annoy you as much as it does me? And what do you think of Ben's explanation? First of all, I think your underlying assumption in this question – that education issues are “defined in the media in general as driven almost entirely by the UFT” – is a bit of an overstatement. I write at least one education story a day, on average, and I haven’t written a UFT story in a week or so, at least. A quick check shows the last article I wrote mentioning the UFT was about their charter school getting a reprieve from closure on Feb 27. Since then I’ve written about a number of topics including: safety agents, hazing, STEM, etc. But no teachers union. However, I won’t dispute your point that the union wields a lot of clout in our dialog about the city schools. Maybe even too much clout. I don’t know. I do have some guesses as to why they are a major player– and my observations are probably not news to you or anyone else. For one thing, I think the public conversation on education in the city often falls back on city vs. union in part because both of those parties continually take shots at the other. They often blame each other for failures in the system. And outsiders (politicians, “experts,” etc.) often blame either the union or the city for the problems in the system, too. It’s a facile narrative that people are drawn to for obvious reasons. First of all, it’s an easy, two-warring-parties way to view the complex story of public education. Also, people are drawn to labor vs. management stories in all kinds of contexts. But I think people also concentrate on the union vs. the city because they are both powerful forces in our public schools. The city cuts the check and sets the policies. The teachers union represents the boots on the ground. At least that’s what it’s supposed to do. And not take anything away from principals, but teachers are probably the most significant adults in the public schools. It’s much harder to grasp the significance of the social, economic and other factors at work in our public schools. Obviously parents are a huge factor. But what about the character of the larger communities that the kids inhabit? That’s huge too. And what about money? That’s a huge factor too. What about technology? Lots of kids don’t have computers or smart phones. That plays into it as well. And so many kids in our diverse city come from different cultures, which also has a huge influence. To sum it up, anyone who pays attention to the public schools can see that they’re some of the most complex, compelling and important things that we can ever hope to encounter. As a reporter I try to do them justice. I’m sorry if folks feel that our coverage is too simplistic, but I am doing my best. One way to improve the coverage of the public schools is to contact us reporters. My email is bchapman@nydailynews.com and my phone number is (212) 210-6365. I always want to hear from as many stakeholders in the schools as possible and I can be trusted completely to maintain the anonymity of whistleblowers. The notion that there had been a great improvement in the public schools, leading to sharp increases in achievement among minority children—the majority of the city’s public school students—was echoed in the mainstream media. 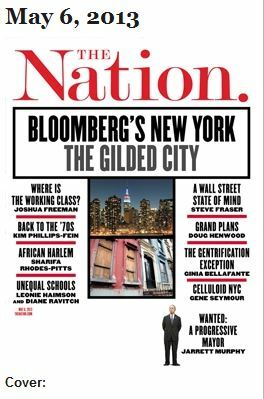 It helped Bloomberg retain mayoral control of the public schools, which the state legislature had granted him shortly after his election in 2002, and to win a third term in 2009 (a campaign in which he spent a record $108 million). Unfortunately, his claims of closing the achievement gap proved misleading. For the rest, go check it out. For more on this issue, see the DNA article here. CWC's Core parent group = "Predominantly white"
From the earliest stages, CWC identified the white, affluent families in Williamsburg (and later, Crown Heights) as the "community stakeholders" who would help them form their proposal. These families, none of whom had school age children, were targeted with private information sessions and invites sent through email lists and members-only listservs.
" 'Through targeted outreach and recruitment, our schools are intentionally designed to reflect their surrounding communities and the larger society in terms of race, ethnicity and socioeconomic status,' the charter network says on its website. 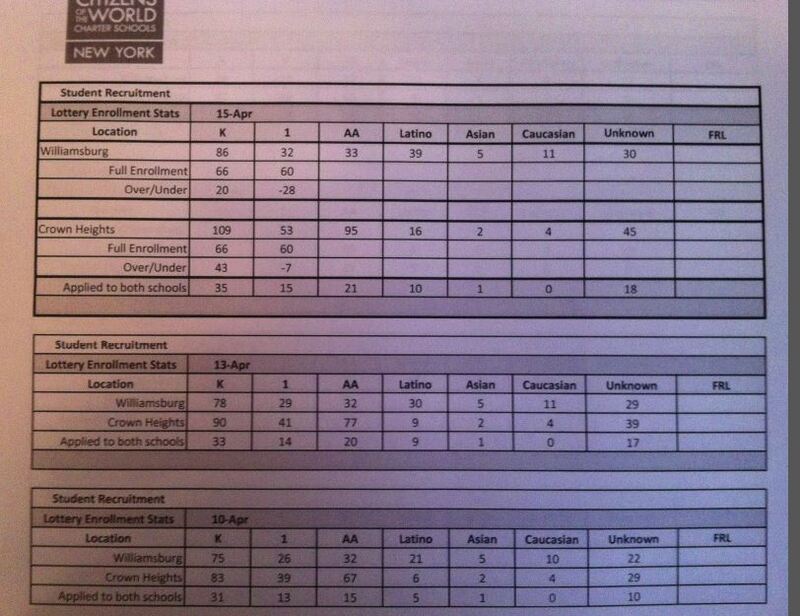 But the New York enrollment memo seems to directly contradict that statement, with the most time and resource-intensive recruitment tools clearly aimed at a small pocket of affluent families, while cheap, low-impact tactics like handing out fliers reserved for Headstarts and churches where recruiters are instructed to 'lean towards' black and Hispanic families. 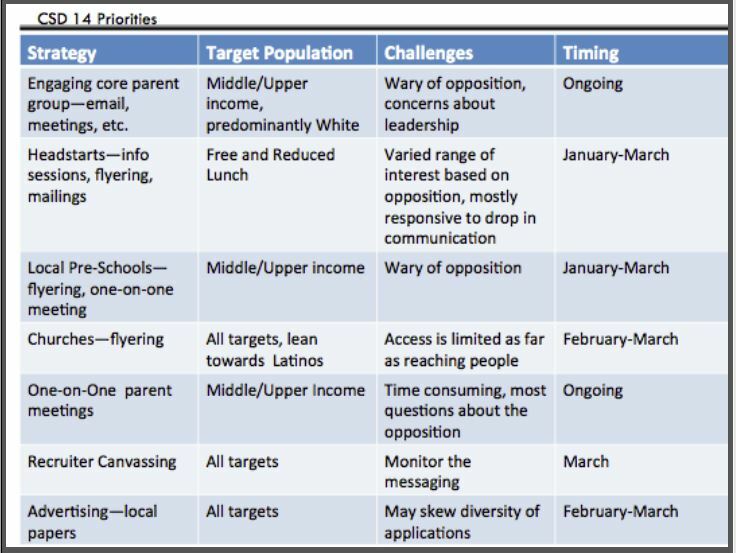 In District 17, the top priority is to 'create core foundation of contacts,' a strategy again targeted exclusively at 'middle/upper income' parents. Roughly half of the engagement strategies outlined in the memo are specifically intended to attract those same targets." Citizens of the World New York had posted this marketing memo on their Board website, but quickly pulled it after a day or two. We posted a copy of the page that relates to Williamsburg and a full copy of the Enrollment Plan for others to review. In addition to the marketing memo, there are questions about CWC's promise of "diversity." The following document, which was downloaded from the CWC NY Board website, is a tally of all CWC's applications to date. What we find unusual is that applications are grouped by race. Yet in all of the student application forms (print, online, and Common App from NYC Charter School Center), there is no place where parents list the race of their child. Where are they getting these numbers? How can they guarantee authenticity? From all evidence, there is no way to determine whether the applicant is “AA,” “Latino,” “Asian,” or “Caucasian” (as listed in CWC's document). Interestingly, since this document was first downloaded, CWC has changed the document to remove the race categories. I urge you to pull New York student data out of inBloom like Louisiana did. I have already written to Commissioner John King informing him that I do not give permission for my children's data to be released to any entity. I do not want my children's personal data, photos, health histories, special education status, and other information stored on a cloud. I do not store any of my own or my children's information in a cloud, nor do I give it to private corporations, and I expect others to respect my right to privacy. "Data" has become a loaded weapon in the hands of federal, state, and city education departments and it is causing untold damage to the quality of life in my children's classrooms. Teachers are operating under in an atmosphere of fear because of how politicians are using "data." Decisions are being made based on "data" without real, first-hand knowledge of how those decisions will play out in schools. "Data" is being used to replace the insights of human beings based on human interaction. Resources are being diverted from our classrooms to the favorite entrepreneur du jour and our children are the poorer. I ask that you put a stop to the packaging, buying, and selling of our children's identities, and return the attention of our education department to the very real and dire work of supporting teachers and students in the classrooms with what THEY need, not what the education technology industries claim they need. John White, the Louisiana State Commissioner of Education, announced Friday he was pulling the state's student data out of inBloom Inc., because of the protests and privacy concerns of students, parents and the some members of Louisiana Board of Education. Parents and privacy advocates in the eight other states participating in inBloom should urge their officials and Boards of education to immediately follow Louisiana's lead. At Wednesday's meeting we heard some compelling testimony regarding the state's and school districts' data storage practices. It's an issue worth continued discussion with the board. The data storage agreement with the inBloom database was undertaken with caution and a sense of responsibility. However, because of the concerns expressed by some parents, and because we have not yet had an in-depth discussion with the board and public about data storage at the agency or district level, I think that it is best for now that we withdraw student information from the inBloom database. I have told our staff to do so and have informed inBloom of our decision. Thanks as always for your time. Have a great weekend. Parents: please send a message to the Regents asking them to withdraw from inBloomtoday! Tomorrow, the members of NY Board of Regents are meeting to discuss the state's plan to share highly confidential, personally identifiable student data with a corporation called inBloom Inc., which intends to share it with for-profit vendors without parental notification or consent. On Friday, John White, the State Education Commissioner of Louisiana, announced he was pulling his state's data out of inBloom, because of the privacy concerns expressed by parents and the members of his state's Board of Education. Please send a message to the NY Board of Regents today, asking them to follow Louisiana's lead. A sample message follows, along with the Regents' email addresses. Feel free to alter the message any way you like, but please send it today! Last week, John White, the State Education Commissioner of Louisiana, announced he was pulling his state's student data out of inBloom Inc., because of the strong privacy concerns expressed by parents and the members of his state's Board of Education. As I parent, I urge you to do the same. Louisiana is the only state along with New York that was planning on sharing student data with inBloom Inc. statewide. The data which New York State Education Department is providing to inBloom will reportedly include student names, addresses, emails, phone numbers, along with their grades, test scores, racial, special education and economic status, as well as disciplinary records. inBloom intends to store this highly sensitive data on a cloud, and has already said that it will not be responsible if the data leaks out in storage or transmission. New York and inBloom then plan to provide this highly sensitive personally identifiable data to for-profit vendors without parental notification or consent. Articles about this controversial plan have appeared in Reuters and the Daily News, among other media outlets. I urge you to follow Louisiana's lead, and pull our student data out of this risky project immediately. Do New York children deserve less privacy than children in Louisiana? If the data leaks out or is used inappropriately by vendors, it could damage a student's prospects for his or her life. If you do not decide to withdraw all the state's data, I ask that you at least require parental consent, so that I as well as other parents can decide for ourselves if we would like our children's most sensitive information shared with inBloom and other corporations.